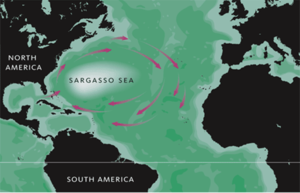 ^ The Unique Sargasso Sea. （原始内容存档于2010-02-11） （英语）. ^ The trash vortex. Greenpeace. [2008-04-20] （英语）. ^ Ruth Heller. A Sea Within a Sea: Secrets of the Sargasso. Price Stern Sloan. 2000. ISBN 978-0448424170 （英语）.